Online Poker Tells are just as damaging as the physical tells that you might see at a live poker game. Knees bouncing up and down, pulses throbbing on the neck, the shaky hands are all physical tells that are useless in online poker, as you or your opponents cannot see each other. However in online poker games tells are formed by the way that you play, you actions and your tendencies. If you are not very careful then skilled online opponents, who have honed their skills of reading opponents online, will soon pick up on information you give out. Those that a paying attention to you will notice the way you are playing the same types of hands in the same way over and over again, the way you are establishing tendencies that they can use against you. Once they have this information they can put you on a smaller range of hands by understanding how you have played in the past. All is not lost though, because they can only use this information if you don’t protect yourself from it. The way to protect against it, is to send out lots of mixed signals, so that your opponent either gets it wrong, or just gets completely confused. The first thing you need to do to get rid of your own online poker tells is determine if you have any, so lets take a look at all the stages of a poker hand and discuss what you should be looking for and how to set up your defence. Before the flop is the start of the story. You have just received your hand and you need to decide if you are playing or not. It’s amazing just how many players are predictable before the flop. And a range of hands that although not very good they want to play so they limp in and just call the big blind. Hopefully, you can understand that if you act in a consistent way like this, it doesn’t take a genius to know what kind of hand you have and when. Pretty soon, the good players will be folding when you raise, and raising when you limp knowing exactly the strengths of your hands. How much is your Raise? One of the biggest online tells and playing tendencies involves pre flop raising and in particular the size of it. Many Internet poker players alter their opening raises depending on their starting hand. For example, they will raise more with A-A and K-K than with any other hand. Again, this is a bad idea. You are setting up a code to let your opponents know what you have. The way to overcome this is either raise the exact same amount with every hand no matter what it is whenever you raise. The other way is to vary your opening raises across all hands that you raise with. I find it easier to make the same size raise with any hand when I enter with a raise. This way none of my opponents can put me on a hand before the flop. The next area to consider is whether you are displaying any tendancies by the way you play in position. Position in Poker is a very important subject, and a good player will not be playing many hands in early position. However if you limit yourself completely in those positions and only play premium hands, then again you are setting a pattern that allows your opponent to know that if you are raising from early position you probably have A-A or K-K or similar. These are exactly the hands that you have waited for as well, and this is one of the most costly online poker tells. The way to combat this tendency is to occasionally raise from early position with other hands and make sure that your opponent see these weaker hands. There is a fine line between raising with other hands enough to mix up your play and raising with too many hands which will reduce your chances to win. The best way is to keep track of how often you raise from each position so you know exactly how often you do so. So the moral of the story is that you have to randomise your preflop play and eliminate any patterns. For most players this is quite hard to track the hands you are playing and how you are playing them to ensure you are not developing any patterns. So here is the way I recommend you doing it. For each position at the table compile a list of hands that you will always (or almost always) want to raise with. You can split them into early, middle, late and blinds if you don’t want to do 9 or 10 different lists. Once you have these, add a group of starting hands to each group that you will occasionally raise with. For example, from early position you may want to always raise with A-A, K-K and Q-Q and the hands that you will occasionally raise with would be J-J, 10-10, 9-9, 8-8, A-Ks, A-K and A-Qs. Your list might be different, but this is pretty close to the list I use (For those of you wondering, my list also includes a few smaller no gap suited connectors). Whenever you are dealt one of the hands on the “occasionally raise” part of your list then look at the second hand on your watch. If it is within the first 5 seconds after a minute, make your standard raise. Otherwise play the way you normally would. Some players use the first 10 seconds after the minute. When you use the first 5 seconds, you will raise with 1 out of every 12 of your occasional hands and if you use10 seconds you will raise with 1 out of 6. This keeps your opponents from putting you on a definite hand from your pre flop raise. Your opponents will already put you on a certain range of hands, but there is nothing you can do about that without giving up too much expected value. Every decent poker player knows that if you raise from early position you probably have a decent starting hand. The nice thing about a hand like 8-8 or 9-9 is if the flop doesn’t include anything too high, you may be able to pick up the pot uncontested on the flop just by betting. In addition, the times you hit a set you have a will disguised power hand that may be very profitable. One thing to think about before you start using smaller pocket pairs from early position is many players with pocket pairs will call an early raise hoping to hit a set. The lower your pocket pair is, the more likely it is that when you hit a set an opponent can hit a larger set. When this happens you will lose a large pot. While this will happen occasionally, you increase the chance by raising with small pocket pairs, especially from early position. You need to use the same type of system for hands that you usually limp with. For example, if you always limp from middle position with middle pairs and large suited connectors, you should occasionally raise with these hands. The key point is that a limited amount of the time you need to do the opposite of what you normally do. This is the only way to keep your online tells and playing tendencies from your better opponents. The next area to look for your own playing tendencies is how you play after the flop. Hopefully from the detailed section above on playing preflop you now understand how to look for and identify patterns that might be emerging from your actions. 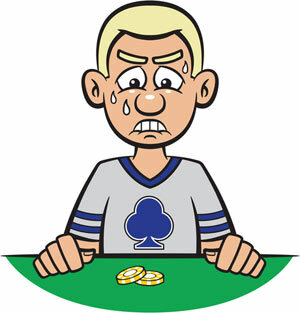 When you are the pre flop raiser, do you always bet on the flop no matter what the board looks like? Or do you only make a continuation bet when you still are sure you have the best hand? If you always make a continuation bet after raising pre flop, your opponents will be able to use this against you. The way it usually happens is when they have a stronger hand than you do. They don’t have to worry about building the pot because they know you will do it for them. They also know that they can check raise your flop bet and have a decent chance that you didn’t hit the flop and possibly force you to fold. It’s also a bad idea to only bet when you improve and to check when you don’t. Anything you do consistently every time a certain situation arises can be used against you. To combat this, once again you can use the second hand on your watch trick mentioned above. Decide how often you want to make a continuation bet after a pre flop raise and use the second hand to make your decision. For example, you may decide that you want to make a continuation bet almost all of the time, so you always make the bet unless the second hand is within the first 5 seconds. This way, while you usually make a bet, you won’t always do it, and it will have nothing to do with the strength of your hand. This makes it next to impossible for an opponent to put you on an exact hand or even a small range of hands. Don’t go overboard with this, or you’ll give up too much expected value by playing incorrectly. The aim is to add variety into your play to disguise and protect your hands, not to play incorrectly, so you have to be careful and limit the times that you play a hand sub-optimally for the sole purpose of disguising your patterns. One more thing is when you have a strong hand but need to make a bet to force an opponent to pay a high price to draw, you should always make the correct play. It is more important to charge them to draw than to hide your hand. If they are drawing to a flush or straight they already know your hand is better than theirs so you don’t gain anything by playing around. We’ve covered Preflop and On the Flop in some detail, and the turn and river are no different. You must again look at your turn and river play in the same way to see if you have developed any tendencies. I’m not going to go over the same ground again, but for example you should be asking yourself do you always bet on the turn and / or river when you feel you have the best hand? It’s important to vary your play in every area of your game, especially when you are playing against other good players. This is especially true as you start playing at higher levels. At low and medium level tables most players aren’t paying attention. But at the higher level tables most of the players know how to play fairly well and pay attention. But you have to tightly control how often you are making plays that don’t lead to your highest expected value just to camouflage your play. If you are giving up more expected value than you are gaining by hiding your play, you are better off just playing straight ABC poker.